We have a new product! 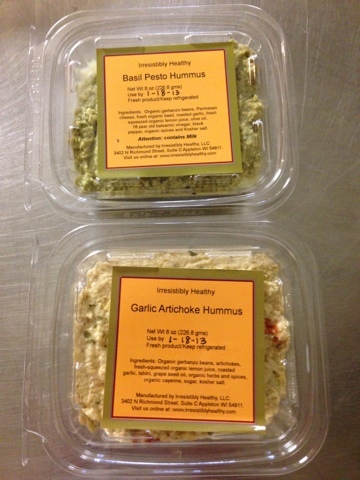 We have fresh hummus from a company called Irresistibly Healthy Hummus! They make the hummus from organic garbanzo beans and a lot, if not all, of their products they use are organic. This is a great-tasting product and we have 2 varieties this week...Garlic Artichoke and Basil Pesto. Also this week, we have some homemade dips including Onion, Jim's Chip Dip, Zesty Garlic, Braunschweiger Spread, etc. We also have Fresh Chicken Wings!